At the close of the day, you pull out a trash bag and pick up anything that you may have left as well as every other bit of trash that you see in the area. Leave it cleaner than it was before you arrived. Stop by the farmhouse on the way out and extend a warm handshake to the one who allowed you access, share the digital pics if you have them, and let him know that you cleaned up the area. Response? ?You boys are welcome back anytime!? Ask what kind of soda pop he likes or his favorite kind of beer and bring it with you on the next trip. This is not a dream; this is real. 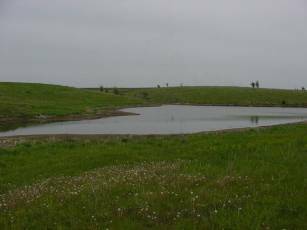 Southeastern Nebraska and Southwest Iowa have the largest concentration of farm ponds in North America. Most of these are teaming with state-stocked fish. 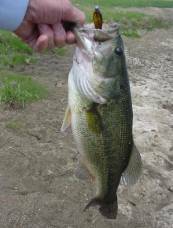 Largemouth bass, bluegill, crappie, catfish, carp, and sunfish are the most plentiful types of catchable fish. The fish and game departments add fish to keep the lake in balance as well as the water quality. Some of the lakes were stocked many years ago. This bass was caught in a very old farm pond near Ashland, NE. The pond is only about an acre, if that. Twenty inches and about 5 ½ pounds is what she weighs. The lure was a Madtom of course, root beer pepper the color. This is a great pond, steep banks, almost non-fishable from the shoreline. You have to drop your tube in on the dam side, as there is no other access. Deep, nearly 20 feet at the center, with lots of structure, downed trees, weeds and clear water. I caught a fish on my first cast, a bass at 11 inches. More of the same, again and again. I had heard that this pond might hold some large fish, so I kept up my pursuit and found the perfect spot. On the side of the pond was a pocket that cut back into the steep bank. It was about eight feet back from the rest of the pond, six feet wide, and more than five feet deep. There was a tree trunk lying across the entrance about a foot below the surface. Slowly, I positioned my float tube about 20 feet out from the entrance of the tiny bay. I cast the Madtom across the top of the trunk and hit the bank at the rear. It tumbled into the water and I started bringing it toward myself?as it got to within a foot of the submerged trunk the water exploded, up came this beautiful bass with my lure embedded in the side of its gaping jaw. It was a thrill as it landed on my side of the trunk with the hook firmly set. After a bass and Jim tug of war, I won?the proof is in the picture, as is the smile on my face. This was a fat and healthy beauty that any one of you would be proud of?from a one-acre pond! Of course not every pond is like this. The picture below is a pond with no trees that I fished on May 24th. About 2 ½ acres, the water was clear spring water and there was no visible cover this early in the year. But?the fish were swirling in the shallows as I approached on foot. They could see me walking in and headed for deeper water. Take a look?no structure, except for one visible bush in six inches of water?the rancher that owned it told me that it plugs up from weeds by mid-summer, so the cover is seasonal. I tried several types of artificial baits, including spinner baits, which are usually effective when the bass are shallow, but no luck. I arrived just after twelve noon, so they were not in the mood, and too spooky to stay in the shallows?so?sounds like a commercial, but no fooling. Root beer Madtom again. Sorry, but they kill bass, and do it so effectively it is scary. Here are a couple of the fish. It is hard to shoot good pictures of live fish with one hand. The bass measured just over fifteen inches and was fat and sassy. (check out the lure!) The tail swung away as I took the shot. The crappie is a beauty for a pond of this size. Note how healthy both fish look. Five largemouth bass and four crappie later I was on my way home. 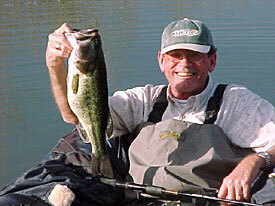 One last comment from your float tube guy: All of us love to see others get interested in fishing. I was float tubing in Lake Yankton again recently, and as I sat in my tube, there was a family nearby on the bank. The young lady that was with her parents kept pointing out how well she was casting and having a great time. Then I heard her say, ?Dad, I want a fishing pole for my birthday.? Well, I had fished my fill, caught several bass on my favorite lure?so I finned my way to shore and started letting the air out of my float tube. Note that my car was parked right behind where this young lady and her parents were fishing?I could still hear her excited comments, so I called down the bank and asked when her birthday was. She ran up to my car and said ?this Wednesday!? With her parents permission, I reached into my car and pulled out a brand new Berkley Lightning, two-piece graphite rod. ?Happy Birthday!? I said and she smiled from ear to ear. ?Now all your Dad needs to buy is the reel.? The great smile was worth 1000 fishing rods. Good luck fishing and keep those hooks sharp! Jim's email address is not working, so I am forwarding his email to my address until I hear back from him. Wow this site is a great find! I didn't know this site existed. Thanks for the tip!